If you’ve ever dreamed of having a pet sitting business, then this one’s for you! 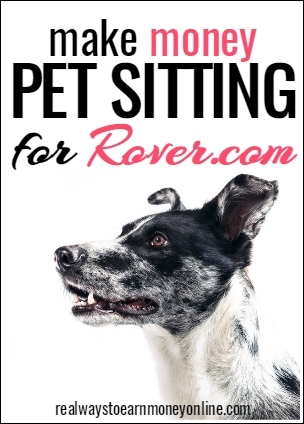 Today we're talking about Rover, a site that makes it possible to earn money as a pet sitter by connecting you to potential clients who need pet-sitting services. Rover has been featured in The Wall Street Journal, The New York Times, and The Los Angeles Times among other major media outlets. How Do You Become a Pet Sitter for Rover? You can become a pet sitter for Rover by filling out the online application and creating a profile. Your email will be verified and you can also download the app to your cell phone to make the process even easier. Part of the application involves a background check (note this does not include a credit check). Rover also gives you the tools, videos, and marketing ideas for promoting your business. In addition, the company has a blog and a forum where you can ask questions of other pet sitters. How Does Pet Sitting For Rover Work? Once your profile is live on the site, you simply wait for a request to come in for pet-sitting. Rover claims that most people get their first request within one week. You may pet sit in your own home or travel to the client's home to pet sit. You may also watch more than one dog at a time if that is what the client has. Just be sure to adjust your prices for that! You can also add additional walks, grooming, and overnight care to the equation and make more money. You may be able to bring the dog to your home to pet sit and play with your dog if that is okay with the client. Just make sure the two dogs look as if they will get along. How Much Can You Make as a Pet Sitter for Rover? That will depend upon whether or not you are working full-time or part-time. Some people use it as a side gig (for example, to help with college tuition) while others work full-time and average over $17 an hour. You will be the one setting your own rates although Rover invoices and bills the client for you. Rover deducts 20 percent of your earnings from each payment. They keep this portion to cover the costs of sitter benefits, providing the website, etc. Rover also covers pet insurance and 24/7 emergency service for the pet owners using the service. There is no charge for the insurance for the pet owners, because it is underwritten by a third party. Your payment for sitting services will show up in your Rover account approximately two days after the service is complete (minus Rover's 20 percent fee). You can then withdraw your payment. Rover will send the funds via either Paypal or mailed check. Note that Canadian sitters only have the Paypal option as of now. Can Other Animals Be Cared For or Is It Just Dogs at Rover? Absolutely other animals can be cared for through Rover! Cats, goats, pigs, horses, lizards, birds, turtles, and many other animals have all been served at Rover. Obviously, for large animals such as horses the sitter will have to come to the home as large animals are not easily transported. Can Anyone Work for Rover? Rover is currently available in all cities in the United States. There are also Rover pet sitters in Canada. How Can an Interested Individual Get Started With Rover? Go to the website and start the application process. Good luck if you decide to go for it! Post originally published May 22nd, 2015. Updated and republished on October 15, 2018. @Amy – Bless you for sharing. That is wonderful! I always enjoy when readers share their personal experiences–both positive and negative. However, I AM glad that this one was a positive one. Thanks Leisa. I just gound out I am going to lose my job in Friday so it’s a big help. @Amy – Sorry to hear about your job, but you sound like a smart girl who knows how to plan ahead and also be innovative. Good for you! I love pet sitting for Rover. I am booked through June My earnings total about $1000 from March-June. It’s a great gig for the summer time. If you want to start a pet sitting or pet walking business, this is a great place to launch it.